As Pope Francis mulls a report about women deacons in the early church, a new survey reveals that at least when it comes to U.S. bishops, support for ordaining women as deacons remains uneven. 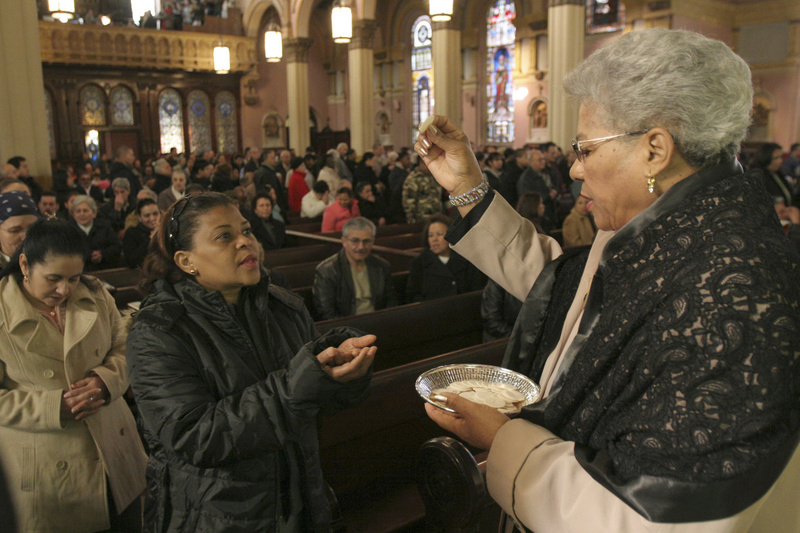 According to a report released by the Center for Applied Research in the Apostolate at Georgetown University on Jan. 22, just 33 percent of bishops in the United States think the church “should” ordain women as deacons. Late last year, a papal commission wrapped up its work studying whether the early church ordained women as deacons and passed its findings on to Pope Francis. Two of the commission’s 12 members—Phyllis Zagano and Bernard Pottier, S.J.—said in an interview with America last month that their own research supports the idea that women were ordained deacons in the early church. If the path forward for women deacons follows a similar route as the reintroduction of the permanent diaconate following the Second Vatican Council, the pope would first have to acknowledge that women deacons existed in the early church. Then national bishops conferences would decide if they wished to seek permission to reinstate the practice in their countries. The final decision for how each diocese would approach the issue would be made by individual bishops. Most bishops seem opposed to the idea altogether, with just 41 percent saying they believe it is “theoretically possible” to ordain women as deacons. If Francis were to follow that process, 79 percent of U.S. bishops say in the CARA survey, they believe the U.S. Conference of Catholic Bishops would allow individual bishops to decide for their dioceses. If given that option, 54 percent of U.S. bishops say, they would “consider” ordaining women as deacons in their dioceses. But most bishops seem opposed to the idea altogether, with just 41 percent saying they believe it is “theoretically possible” to ordain women as deacons and only 33 percent saying they believe the church “should” ordain women as deacons. Just 27 percent of bishops think the church will move ahead with ordaining women to the diaconate. Pope Francis’ commission on women deacons involves 'high stakes,' says one member. Even while there does not appear to be widespread support for women deacons among bishops, most of them said they would find women deacons to be “somewhat” or “very helpful.” For liturgical celebrations, 61 percent of bishops said women deacons would be “somewhat” or “very helpful”; 71 percent said they would be “somewhat” or “very helpful” for “word ministries”; and 83 percent said they would be “somewhat” or “very helpful” for charity ministries. More than three-quarters of bishops, 77 percent, agreed “somewhat” or “strongly” that women serving as deacons would lead to increased calls for women to be ordained as priests. According the survey, bishops and deacon directors believe the greatest challenges when it comes to accepting women as deacons could come from priests, male deacons and laity who are opposed to women serving as deacons. They expect as well challenges from some Catholics who fear that ordaining women as deacons could lead to louder calls to open the ordained priesthood to women. The real story here is that two thirds of American bishops apparently believe that the Catholic Church (at least in the U.S.) should commit institutional suicide. There is no principled or logical rationale for excluding half of humanity from clerical roles in the Church, and the sooner the Church stops whining about (or ignoring altogether) the cataclysmic decline in candidates for such roles, and realizes that Jesus Christ could not possibly have meant to exclude women from the clergy, the sooner it halts its current march toward irrelevance. Apparently, you know better than 2000 years of Magisterial teaching. Take a thousand years off of your estimate. The Vatican Commission found that women were ordained deacons for the first thousand years of Church history. Your response--and the response of 2/3 of the bishops--is further confirmation of the deeply ingrained misogynism that permeates the Catholic Church. You want to believe the Church is unchanging. But it has always changed, often in very fundamental ways. And if it is to survive this current crisis--in both moral authority and leadership--it needs to make room for women, formally and officially within the Church hierarchy. The real struggle is less over Church teaching and more about the entrenched culture of male clericalism. Francis fights against it. But those with power are loathe to give it up. "...make room for women, formally and officially within the Church hierarchy." Ok, Put women in charge, maybe also relax moral codes and doctrinal purity, make women deacons, priests and bishops, and all growth and vitality problems will simply vanish, and the world will once again be edenic. This strategy has not worked out really well for the Episcopalians, who are now on life support, with 10% drop in membership in just five years and an astounding 20% drop in ten years (Presiding Bishop Katherine Jefferts-Schiori (a former Roman Catholic) was in charge the whole time. (Source https://extranet.generalconvention.org/staff/files/download/22938). That's 1 in 5 Episcopalians who have left the building in just ten years! During this same period - a most difficult time for the Roman Catholic Church - The Catholic Church grew by about 3 Million, or roughly 6 times the size of the entire active Episcopalian population in the USA. (source: http://cara.georgetown.edu/frequently-requested-church-statistics/). I am all for more women's leadership roles in the Roman Catholic Church, but let's not make statements that we cannot support, and create the now tired dichotomic drum-beat of the angry feminist that "all men are incompetent and evil." The magisterium has never voted against allowing women to be ordained ever. There is no such record or proof that the magisterium ever did or would now vote unanimously to support our ban against women priests. That is what is required for this to have been an infallible dogma. It is not now an infallible dogma and because such a rule would be in direct conflict with what Jesus himself taught about how we are allowed to treat each other and still be considered one of his saved followers, it can never be a dogma without the Catholic Church making itself no longer a Christian religion. No amount of popes or bishops trumps the authority of Christ's commands written in the gospels and he commanded we treat no one differently than we wish to be treated - this leaves no room for misogynistic bias against women and it leaves no room for women to ever be treated differently in our church or world. Robert Bellarmine---Apparently, you believe that Magisterial teaching has been consistent for 2,000 years. Thanks Jeffrey, Someone not totally sound asleep. I have helped to lead a group of teens in a confirmation class, and all of them male and female can't see why anyone would want to continue on as Catholic while we treat women less than men sacramentally, by keeping them from being ordained priests, bishops, or made cardinals and popes. What percentage of bishops don't like women priests can be fired or retired and replaced with qualified women then we would have 100% justice minded bishops. Best way to cure sexism in our church is by dumping all the sexist leaders. We as laity need to fight back now before there is no church left. Don't bother with fighting for women permanent deacons - they have no power or authority in our church anyway. Unless, we are demanding women be made transitional deacons and demand they be allowed to be become ordained priests same as their brothers within a year, backing deacons is backing sexism with a new fancy title. We should have no permanent deacons and all of them should be replaced with trained lay leaders - male and female - immediately. There is nothing currently that a permanent deacon does that lay leaders can't do instead and with better reception from the laity. The majority of Catholics in countries where the majority of people are educated to be able to read and write in their own language up to a 3rd grade level want women ordained priests and many people have left and are still leaving our church because we do not treat women the same as men, and as Christ commanded we treat all people. The Bishops need to kick the dust off their feet and quit getting mired down by Feminists. The 'Smoke of Satan' Bishop Sheen spoke about is fully represented by this bunch of power hungry bullies who deny the Authority of Jesus Christ Himself because He was a man. I say 'move along girls'..and take your four hundred dollar shoes with you......There are plenty of trendy religions already out there. I initially took heart from headline, that 1/3 of Vatican trained and appointed bishops were willing to move forward. However, I reluctantly agree that institutional suicide or at least a much smaller and much universal Church is in our future. Then we laity need to make a small just church. We need to fight against married priests until they ordaining women to priesthood. We need to reject bishops who are sexist and do not support same sacraments and treatment for women and men. We have a few young left who are hanging in our church by a thread. We can make a bonfire larger than the Holy Spirit fire-filled church we had in the beginning, with only a few flames left but once those flames are gone - we are done. God will take what strength we have had and give it to churches who will act with justice for all. Our teens and young adults will not remain in an unjust misogynistic church. It will be hard enough to get those who left to try our church again once we have started to ordain women priests and bishops. It is up to us to publicly protest and get real. I expect the Canadian bishops to fall into the same statistics. Women are the backbone of our religious practice...we will not be ignored much more before we find a new faith home. The Canadian Anglican Church is a welcoming home. This discussion should have happened about 100 years ago. This woman has joined the local Episcopalian Church and is quite happy with the female rector. It is clear that she has a calling to the ministry; as much of a calling as any male priest. The discussion about slavery took much longer to occur. 100 years is a drop in the bucket. "Just" one third? One third of bishops who are constrained in what they can say is "just" a lot! How about surveying parish priests anonymously or Catholics in the pews publicly? I agree with the other commentators--time is slipping away from us. Even with Magisterial support, the Church may not be able to right itself. With the clergy and the faithful divided there is little hope. Something is coming to an end here. I feel it as do many others. What it is I do not yet know but we are at the end of one thing and the beginning of another. Right now, we have choices on how that might come to pass but it will not be long before we will be mere observers. And have any of them gone on the record to state this? Nice, Canon Law by plebiscite. these might be the same one third who do not believe in the bodily resurrection of Our Lord. Don't they say it was about one third of the spirits who would not serve and became demons while the rest are angels. As usual, the discussion boils down to POWER...and PLUMBING! It is very disheartening to see that the majority of US Bishops oppose women deacons even though the in-depth study reveals that women did serve as deacons in the early church. I fail to understand this objection other than it is due to their arrogance and pride. These bishops don’t represent the face of Jesus to the modern time. I agree very much with one commenter here – the Church is undergoing a tremendous change that we don’t know yet the outcome. This is why we need to elect the bishops that represent us. If we had been electing bishops, this issue would have been resolved ages ago and women and men would be well situated in our hierarchy serving us well together as equals. There would also have been far less pedophilia and child abuse in our past since patriarchy supports pedophilia and there is much evidence to support this fact. Women would be healthier, especially, in third world nations as this nonsense birth control ban would not exist so our global charities could have helped women get out of poverty and oppression which has been prolonged and exacerbated by our church's ridiculous church law against birth control. We would also have a world with far less abortion since it has been well proven, globally, that all countries that make birth control and abortion difficult to access or make them a crime, have higher abortion rates. It is no coincidence that even today, the countries with the highest abortion rates are Catholic led countries where birth control and abortion are often illegal. Also there would have been far less maternal deaths since these same Catholic Countries have much higher maternal death rates too. Two-thirds of the nation's Catholic bishops are not using their critical faculties by reading history and keeping themselves open to the "sign of the times." I think that the bishops who object are being closed minded and narrow minded are causing destruction in the church and should be removed. It seems to me that these discussions split between those who see the possibility of attitudes changing within the Church and those who see no possibility of them changing. I wonder what God thinks of that. It may be the God is unchangeable in His perfection, but He has given himself to deal with all human beings in all their freedom to be what they want to be. Is it so inconceivable that God Is unused to loving many people who find him inconceivable as well. Does that mean he cannot understand and accommodate one or two thousand years of male dominance without appreciating the possibilities of female equality? The essence of God is freedom, because God understands that love not given freely is conditional love. He wants us as free as we can be. Is there any thought to allowing deacons to administer the Sacrament of the Sick? To perform such as anointing with the holy oils? Would it be theologically poosible for a deacon to hear confessions and give absolution, sacramentally? I would suggest that the Catholic Church enter into dialogue with the Orthodox Church concerning the question of Women Deacons, and let us be honest, Women Priests and Bishops. Jennifer: The successors of the Apostles are the only Authority that can speak for Jesus because He gave that authority to the Apostles. The Church can't 'change' what is given. Chaplains lead in prayer and women have always been allowed to do that.. ...And the Holy Spirit may indeed inspire you in a private way...and you may be given a private revelation... but the only Revelation you may teach is PUBLIC revelation and it is embodied in Divine Revelation (Church teaching). . You don't have authority to stray from that. ,. The Bishop doesn't have the authority to give the Sacrament of Ordination to you, You may lead in prayer.. ... but the Church is defined by Jesus Christ..The Church is described as One, Holy,Catholic, and Apostolic since the Council of Nicaea. It's Holy because it is God made. Because it is God made, the Sacraments and their elements can't be changed. Women have always been able to lead prayer groups but Cannon law spells out the elements of the 7 Sacraments and Ordination can only be received by men. A 'man' is an Element of the Sacrament of Ordination. Jennifer : There is no problem . I'm a Catholic educated woman.....and if you are confusing being a chaplain with a Sacramental office , you had better not be out there 'teaching' anything. You may lead in prayer and that's it. In fact, I have a cousin who is a 'chaplain' at the hospital..
Longing to practice Diakonia in humility and simplicity is a fine vocation. Is this some kind of a joke? Here's the solution: give the boot to the two-thirds who say no. Then ordain women to the priesthood. It's time for the Magisterium of the People. Most of the bishops are fools. Well let’s look at the Bishop’s Report Card, Cover up of Sexual Abuse, Closing of Churches and Schools, young Adult Catholics leaving the Church, Alienating Parishioners with their involvement in government politics, living like kings while asking for more financial support. I don’t know can women do any worse.